Packing ones Apple TV when traveling makes sense for all kind of reasons and having the Plex app makes it even more useful. Well, I opted to bring along my old 3rd gen appletv, don’t want to loose that fancy remote right! One simply plugs in one end of an HDMI cable to Apple TV other into back of hotel room telly and you’re off to the races. 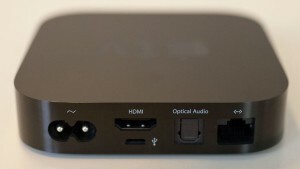 Content specifically Plex is streamed via airplay from the Plex app on one’s iPhone. This was deployed within the first 10 minutes of me being in the hotel room and worked fine. I even set up a Apple TV password that I added to the device at home. Don’t want folks streaming the naughty stuff to my Apple TV right! All worked fine, streaming Plex content from my software based Plex server sitting on my Mac mini that was connected Wi-Fi to my router at home across the internets to the Marriott Wi-Fi network then to my phone and to Apple TV, phew……. it all worked seamlessly even 720 P HD movies. But a day or two later I ran into an issue, only my brand spanking new I phone 7+ could connect to the network everything else my iPad air2, a MacBook Pro, MacBook air, and Iphone 6S plus could not see the Apple TV. Hmmmmm…. I tried the usual stuff, even went into the network settings of the AppleTV and changed the DNS server. There’s also a tweak to spoof the Mac address and get it to connect to the network. The interesting thing was that the AppleTV could not I believe see outside the wi-Fi network, I think Marriott was blocking the device but obviously it was on the same network as the iPhone as this Apple TV third-generation does require it to be connected to the same Wi-Fi network has the device you are airplaying from – 3rd gen does not have the pier to Pier I believe that the new fourth generation onward Apple TVs have. I resigned myself to the fact that the perhaps Marriott was blocking the device on the internal network now. As even my iPhone 7 could not see it. By chance I ended up going into security settings on the appletv turning password off but just I checked the option to verify device. I tried to connect and my iPhone was back in business and now all the devices instantly saw it – some kind of bug? Not sure, but in summary if you’re having problems with airplay turn password off and check the verify devices option. Previous Previous post: Motorola SB6121 & Motorola SB 6141 is NOT End of Life on Comcast! Next Next post: Tmobile – free European data plan is not too shabby!